ROCHESTER, NY, September 17th. 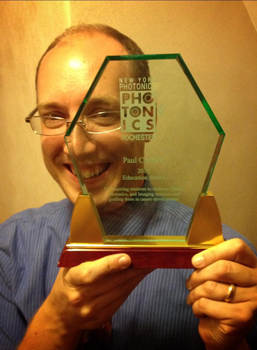 2015 – The Rochester Regional Photonics Cluster/New York Photonics (RRPC) today honored three leaders in education and business for their contributions to New York’s Optics and Photonics Industry. RRPC Executive Director Tom Battley joined past years’ award winners to present the awards in front of more than 300 representatives from industry, government and education from across the region at the New York Photonics 2015 Annual Meeting held in the Rochester Museum and Science Center. The RRPC Entrepreneur Award is given each year to an individual for demonstrating creativity, innovative spirit and drive in pursuit of the dream of creating an industry-leading company in the Optics, Photonics and Imaging Industry. 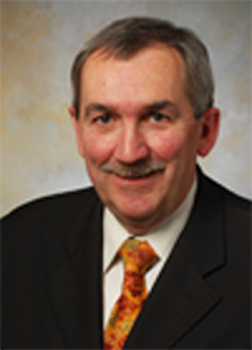 The Entrepreneur Award recipient for 2015 is Bob Bicksler, CEO of JML Optical Industries in East Rochester, NY. Bicksler has served as the President and CEO of JML Optical Industries since the 2011 change of ownership. He is responsible for developing the company’s strategy and has led numerous initiatives to position JML as a leader in the optics industry. Prior to acquiring JML with several partners, Bob served as the President and CEO of a leading provider of software products and services for the mobile device market. Bob has over 30 years of operational and financial background in manufacturing, technology, and telecommunications companies. His track record is one of continued success in growing companies and delivering superior products to a wide range of customers. Bob is a Lecturer (part-time) of Strategy and Entrepreneurship at the University of North Carolina Kenan-Flagler Business School. He is also an active instructor at North Carolina School of Science and Math (NCSSM), part of the UNC system. NCSSM is the world’s first public, residential high school for juniors and seniors that provides a specialized curriculum in the areas of science, technology, engineering, and math. Bob holds degrees from The Pennsylvania State University (BS, Business Administration) and The University of North Texas (MS). The RRPC Leadership Award is given each year to an individual for working with RRPC members and the community to promote the Rochester Region’s Optics, Photonics and Imaging Industry. The Leadership Award recipient for 2015 is Dr. Duncan Moore. Moore is the Rudolf and Hilda Kingslake Professor of Optical Engineering, Professor of Biomedical Engineering, and Professor of Business Administration at the University of Rochester. In 2007, he was also appointed Vice Provost for Entrepreneurship at the University. In this role, he manages the Kauffman Campus Initiative ($10.6M over 5 years). From 1995 to 1997, Dr. Moore was Dean of Engineering and Applied Sciences at the University, and in 1996 he also served as President of the Optical Society of America. The U.S. Senate confirmed Dr. Moore in the fall of 1997 as Associate Director for Technology in The White House Office of Science and Technology Policy (OSTP). In this position, which ended December 2000, he worked with Dr. Neal Lane, President Clinton’s Science Advisor, to advise the President on U.S. technology policy. 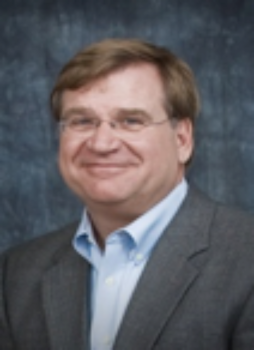 Moore has extensive experience in the academic, research, business, and governmental arenas of science and technology. He is an expert in gradient index optics, solar cell design, computer-aided design, and the manufacture of optical systems. In 1993, Dr. Moore began a one-year appointment as Science Advisor to Senator John D. Rockefeller IV of West Virginia. He also chaired the successful Hubble Independent Optical Review Panel organized in 1990 to determine the correct prescription of the Hubble Space Telescope. He currently chairs the Product-Integrity-Team for the James Webb Space Telescope, the successor to the Hubble Space Telescope. He is also the founder and former president of Gradient Lens Corporation of Rochester, NY, a company that manufactures the Hawkeye boroscope. He holds Master’s and Ph.D. degrees in optics from the University of Rochester, and a bachelor’s degree in physics from the University of Maine. Dr. Moore was elected to the National Academy of Engineering in February 1998, and in 2006 Moore received the Gold Medal of The International Society for Optical Engineering (SPIE). Dr. Moore was the recipient of the 2009 Edwin H. Land Medal presented by the Society for Imaging Science and Technology and the Optical Society of America. The RRPC Education Award is given each year to an individual for inspiring students to embrace Optics, Photonics, and Imaging sciences and guiding them in career development. The Education Award recipient for 2015 is East High School Science Teacher Paul Conrow. Conrow initiated and developed the East High School Optics Manufacturing Lab (Rochester, NY) that includes a complete shop for manufacturing precision optics. He was the initiator, with New York Photonics Executive Director and a team of volunteers, of the Optics Summer Sizzler, a summer immersion program for teaching students and teachers about optics and photonics. Conrow helped run a summer physics research program for area high school students, under the direction of Professor Kevin McFarland at the University of Rochester. This paid experience for students required them to refurbish, test, and experiment with several 3’ x 10’ solid scintillating panels. He has worked with students to perform cosmic ray experiments with scintillating panels on the university campus. The final destination for the panels is FermiLab in Batavia, Illinois as part of a multi-year neutrino experiment that began in 2009.